The Locksmith preferred among many residents is At Your Service Lock & Door. 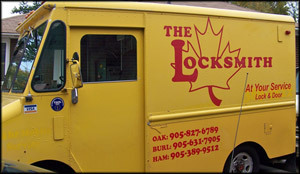 We are a full service locally owned locksmith company. We offer a wide range of security solution services for commercial and residential security requirements. 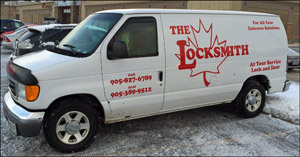 We provide local locksmith services for Oakville, Burlington, Milton, Ancaster, Hamilton, Mississauga and surrounding areas. Locked Out? We can get you back on track. Lock re-keying, lock repairs, changing locks and new door lock installation, master keying, commercial grade lock-sets, a wide variety of hardware for residential clients and more. We are here to safeguard your home or business. At Your Service Lock & Door Locksmith specializes in providing on-site locksmith service to private residences, owners of apartment properties, office/commercial properties, new construction sites and property management companies. As with almost anything in our lives the cost of being proactive rather than reactive is by far less costly, and your home or business security is no exception. Being proactive with your home or business security is not only more cost effective it will give you peace of mind. At Your Service Lock & Door Locksmith will discuss with you the vulnerabilities of what you currently have and provide you with a little locksmith experience (28 years) enabling you to make an educated and confident choice in choosing the right door hardware and locks. The Locksmith Who Is Right For You!